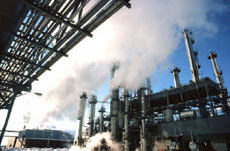 As part of the European Union (EU) movement toward a low-carbon economy and greenhouse gas (GHG) reductions, the EU established an Emissions Trading System (ETS) that imposed reductions in GHG emissions from heavy energy-using power plants and manufacturing, as well as aviation for flights within EU and several other states participating in the ETS. 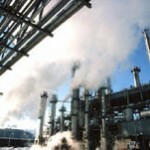 The ETS is a cap-and-trade system, imposing limits on GHGs and allowing participants to trade emission allowances. To expand its climate and energy policies and programs, the EU established GHG limits for sectors of the economy not covered by the ETS. The sectors include transport, agriculture, buildings, and waste, but not aviation or international shipping, nor land use, land use change and forestry (LULUCF). The GHGs covered by the non-ETS Decision are the same as covered by the Kyoto Protocol: carbon dioxide (CO2), methane (CH4), nitrous oxide ((NO2), hydrofluorocarbons (HFCs), perfluorocarbons (PFCs) and sulphur hexafluoride (SF2). 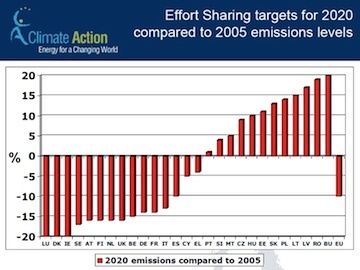 The EU agreed to reduce total GHG emissions by 10% below what they were in 2005 by 2020 for the non-ETS sectors. The 10% target was for the EU as a whole. Instead of imposing the same target on each country, the EU entered into an Effort Sharing Decision whereby different Members were given different targets, based on their relative wealth, with the poorer countries set lower reduction targets than wealthier countries. The national targets for 2013 to 2020 were set in March 2013. The EU has left it to each Member State to determine how it will meet its target. However, certain EU-wide regulations will assist the Members, including CO2 emissions for new cars, and control of F-gases at EU level. The EU also can take enforcement action if the country fails to meet its target: a penalty is imposed for the next year if one year’s target is missed, a corrective action plan is required, and the EU can initiate an infringement procedure against the Member. Determine the progress of the Republic of Ireland on meeting its target under the Decision. If it is not meeting its target, determine what actions the government is taking to avoid any penalties and/or infringement procedures. Has Northern Ireland (NI) been given any concrete target as its share of the United Kingdom’s target under the Decision. If not, why not? If so, what is it and is NI going to meet its target. If not, what is the NI government doing to meet its obligations.